EETN starts construction near Gastonia, NC. EETN breaks ground on 5.9MW solar PV project near Gastonia NC. "We are very pleased to develop a new relationship with Enerparc. Their professional and capable staff have helped us get a quick start on this project" says Robbie Thomas, EETN President. The project is a 5.9MW SolarFlexRack TDP 2.0 single axis tracker. EETN is the electrical and civil sub contractor for this project slated for completion by September 17th. EETN started construction on the Northern Cardinal Solar Project on September 25th 2017. The crew on site reached mechanical completion prior to the new year and is expecting to commission the array in April. EETN is an excellent option for small utility scale projects. EETN is able to assume the entire scope of the project and prevent issues that can often arise from multiple trades operating in a small area. 10.8 MW Cooperative Solar One - complete! 10.8 MW AC combination fixed tilt and single axis tracker. Photo courtesy of Mike Sexton. EETN and partner Valcor Solutions completed work on 10.8MW solar PV installation for the Eastern Kentucky Power Cooperative in Lexington, KY. EETN/Valcor were the electrical, pile and civil subcontractor for the general contractor Lendlease. The fixed tilt portion of the project was SolarFlexRack G3X and the single axis tracker was ATI. This project was an exercise in handling difficult subterranean characteristics that affected civil and pile structural design. "This project was very challenging on our pile team. The geotechnical analysis showed shallow bedrock that ended up preventing 35% of driven piles from reaching minimum embedment. We poured concrete for 554 spread footers for driven piles that did not meet required embedment. The team handled the extensive remediation in stride enabling project completion on schedule." - Terry Hamer, Director of Operations. 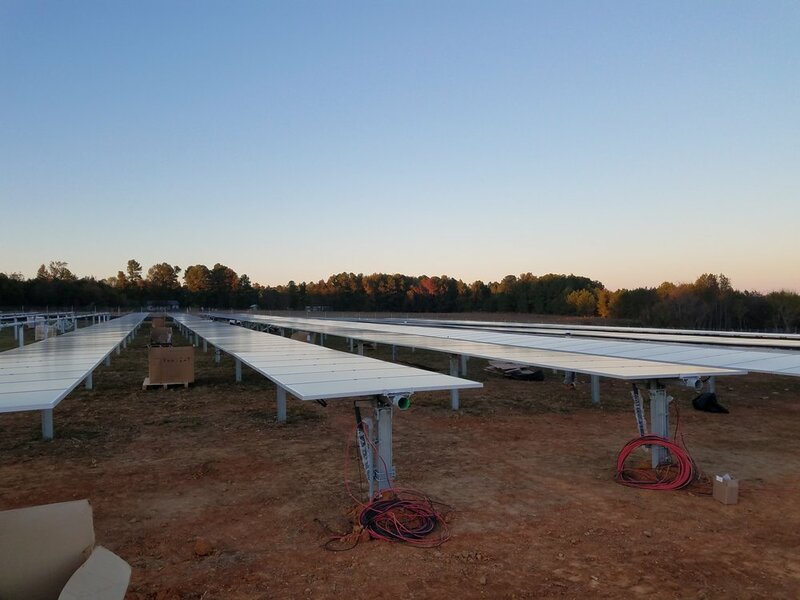 As part of their ongoing relationship with Lendlease, EETN has started construction on a 2.5 MW DC solar PV system near Roanoke Rapids, NC. The ATI single axis tracker project is expected to be complete in less than 2 months. EETN was awarded a contract to install 7MW DC by LendLease. The installation was in Halifax NC and was scheduled for 3 months of site work. EETN installed Solar FlexRack's G3X contour following racking system. The installation included 2400 driven piles for racking mount. EETN's pile driving team completed the project with 5 piles needing remediation. The EETN team reached mechanical completion of this project on March 31, 2017. EETN install team commissioned this 132 kW DC - 98 kW AC system last week. EETN was awarded a subcontract to perform racking, module and electrical install in June 2016. The parking canopy is installed on top of a 5 story parking garage at the Verde at Greenbelt luxury apartment complex in Greenbelt, MD. The location of the array presented significant difficulties in array install. The innovative install team at EETN completed the array with 5 weeks of on-site work. There was a short delay in work while the install team waited on the apartment's electrical equipment room to be completed. The parking canopy is a critical component in the apartment complex being a LEED Gold Certified building. EETN is very pleased to be a part of LendLease's construction team and very proud of our contribution to completing this LEED Gold Certified project. EETN recently completed a 94 kW parking canopy project at the Fiatele Teo Army Reserve Building in Pago Pago, AS. EETN was the EPC contractor for this micro-grid project. Pago Pago is located on the island of Tutuila. The island of Tutuila is powered by several diesel generators and Solar PV power. The Grid on the island is small – approximately 20 MW of peak load. As additional Solar has been installed on the island, the local utility -American Samoa Power Authority (ASPA) has found it difficult to adjust equipment in the event of a cloud related power transient. As a result, ASPA requires battery back-up and power smoothing function for installs greater than 30kW on the island. EETN designed a system utilizing the Princeton Power DRI-100 Inverter to provide the power smoothing function in the event of a cloud related power transient on the system. In addition to the micro-grid aspect of this installation, The customer desired the ability to clean the panels with a temporary walk way. With the space available, EETN was able to devise a less expensive option and instead provided a scissor lift and panel spacing to enable regular cleaning. The corrosive salt spray environment required significant consideration for corrosion prevention. EETN designed a system using PVC and stainless steel hardware on a hot dip galvanized structural steel frame to prevent corrosion. EETN's superior design team and install crew including Young Energy Solutions, completed a very effective install.